Last month, Glendon’s School of Public and International Affairs was honoured to host Canada’s signature two-day conference on Constitutional and Governmental Challenges After 150 Years of Confederation. Many noteworthy guests and keynote speakers were in attendance: the Honourable Louis LeBel (Former Supreme Court Justice), the Honourable Jean-Marc Fournier (Former Interim Provincial Party Leader of Quebec, and Former Minister of Revenue, Education, Municipal Affairs, as well as Attorney General and Government House Leader under the government of Jean Charest), and Dr. Peter Russell (Professor Emeritus of Political Science at the University of Toronto). Several other distinguished professors, legal scholars and journalists took part in the conference. On the first day, Glendon Principal Dr. Donald Ipperciel read out a series of opening remarks written by the Honourable R. Roy McMurtry, who served as the Attorney General of Ontario (1975-1985), the Canadian High Commissioner to the United Kingdom (1985-1988), and as the Chief Justice of Ontario (1996-2007). He also served as the Chancellor of York University from 2008 to 2014. McMurtry was deeply involved in the Patriation of the Canadian Constitution and the creation of the Canadian Charter of Rights and Freedoms. According to Glendon’s own Dr. Radha Persaud (who initiated and chaired this conference), “McMurtry is undoubtedly one of the quintessential makers of modern constitutional Canada”, alongside former Prime Minister Pierre Elliott Trudeau, Jean Chrétien (as Federal Minister of Justice) and Roy Romanow (as Attorney General, and later Premier of Saskatchewan). This quartet of staggeringly brilliant men made up what would later be dubbed the “Kitchen Cabinet”, and their agreement on the terms of Patriation and on the formulation of the Charter would become the “Kitchen Accord”. In his remarks, McMurtry congratulated Professor Persaud and Glendon for hosting the conference, and then proceeded to comment on a recent article published by notable Canadian journalist Andrew Coyne. In his article entitled “Confederation Derailed”, Coyne wrote that Canada can no longer call itself a nation. He writes that referring to Canada as a nation is now “politically impermissible”, and that the term has fallen out of use, like the word “dominion”. His thesis relies on former problems of Quebec sovereignty and the contemporary issues surrounding the recognition of Canada’s 600 different “Indigenous Nations” within the Constitution. The following day, former Supreme Court of Canada Justice Louis LeBel spoke at length about the balance of powers between provincial and federal governments, and the interplay between different rights in our Charter. He jokingly stated that while he served on the Court, he hadn’t lost much sleep over the issue of judicial review. He was also cautiously optimistic about the reconciliation of Indigenous groups within Canada, but said in French that “le droit Canadien est une politique de petits pas”. Dr. Peter Russell followed Justice LeBel with an entertaining take on what he calls “the three pillars distinguishing Canada as a country”. These pillars are 1) French Canada, 2) Aboriginal Canada, and 3) English-speaking Canada. According to Russell, the third pillar became bigger and more powerful in the 18th and 19th centuries; it wanted to make the other two pillars disappear - not through violence, but through their amalgamation into what has become Canada. Only recently has the third pillar ceased trying to get rid of the two other pillars. A fourth character also emerges in this scenario, which Russell calls civic culture. All three pillars came to accept this fourth character, which acts as a glue to keep everything together in a reasonable way, without violence. Russell closed by saying that he is extremely optimistic about the power and legitimacy of the Truth and Reconciliation Commission, but agreed with LeBel that such developments take time, and that we should not become impatient. He also noted something of great importance: the most dangerous thing in our country today is our ill-informed public. In this regard, Canada has fallen behind other countries; we have a serious case of constitutional illiteracy. This can only be addressed by ensuring that we write down and summarize both written and unwritten parts of our constitution for everyone to read and understand. This conference gave many people the opportunity to reflect on our nation’s development by listening to some of the most enlightened and interesting experts in the field of constitutional law. For the rest of us living and working outside the realm of law and politics, the minutiae of daily life can often prevent us from thinking about such issues in great detail. We forget about the all-encompassing nature of our constitution (both written and unwritten). Our Charter is not only unique, but also a prodigious feat of political and legal genius. When we, as a society, become complacent and take our laws, rights, and freedoms for granted, we are more prone to error and acts that contradict the values establishing these first principles many years ago. Voltaire once wrote that “History is filled with the sound of silken slippers going downstairs and wooden shoes coming up.” We still have a long way to go before we rectify the sins of our forefathers, especially involving the abhorrent treatment of indigenous populations through the use of the Residential School System. Yet, we must not throw the baby out with the bathwater. The good parts of our national identity should be cherished and used to care for and promote equality of all disenfranchised populations in the years to come. Our national identity depends on it. Special thanks to Dr. Donald Ipperciel and the members of the organizing committee, which included Dr. Radha Persaud, Ms. Annie Demirjian (Director of the Glendon School of Public and International Affairs), Dr. Francis Garon, Dr. Richard Haigh, Dr. Gregory Tardi, Dr. John Whyte, Ms. Marion Frankian, Mr. Noël Chan, Ms. Teshini Harrison, Mr. Jesse Beatson, Ms. Suzanna Alsayed, and Ms. Andréann Gosselin. 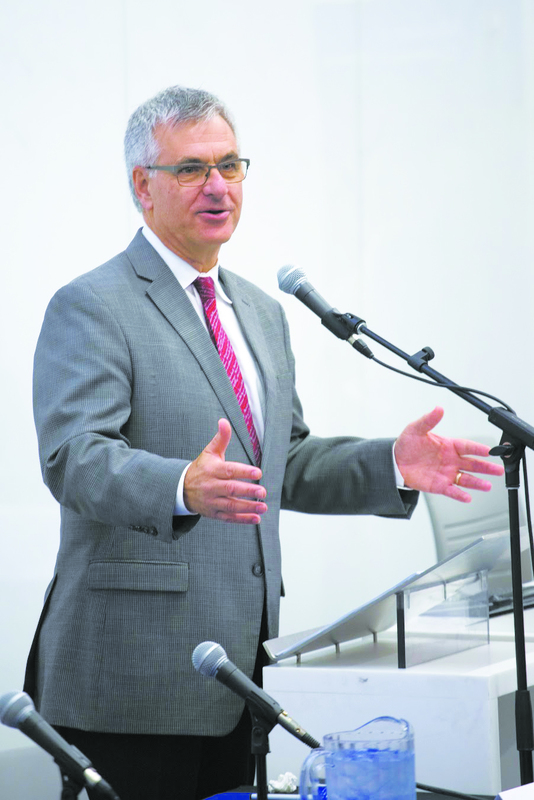 Pictured here: quebec MP Jean-Marc Fournier, Minister of Canadian Relations and the Canadian Francophonie.